Ally Pally was chosen to be television's first home for two reasons. The public one was that, being on top of a hill already, it would be relatively cheap to add a mast to support the Marconi transmitter antenna. The real reason was that the BBC did not want to have anything to do with television, and if it was going to be lumbered with this foolish new idea it wanted it to be a long and difficult journey from Broadcasting House. The banishment had one lasting impact on the language of television. 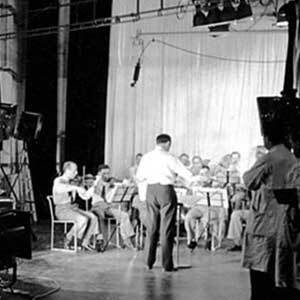 The original Alexandra Palace had a large ballroom which was used for the studio floor in the experimental service. The ballroom had a minstrels' gallery for the musicians, and the BBC decided this would be a good place to put the control equipment. Which is why, at least in the UK, a television control room is known as a gallery. The momentum behind the television service had been largely generated by the Scottish inventor John Logie Baird, who was a genius at generating publicity even if his technology was not actually very good. By the mid-1930s, EMI had also developed a television system, including electronic cameras, and the decree which came down from the Postmaster-General was that the experimental service had to alternate, one week at a time, between EMI's 405 line, all electronic system and the Baird system. There was a toss of a coin to determine who went first, and so it was the Baird system that had the honour of being first on air. But, and it pains me to say this, Baird had only invented half a television system. He created the cathode ray tube display, so we could see moving pictures. And he understood how to manage the electronic signals to drive the CRT, and to be broadcast over radio waves. But he never worked out how to make a camera. That first night relied upon not one but two lash-ups. If either was to be suggested today, the health and safety people would be brandishing their clipboards before you got to the end of the sentence. His solutions used a simple photo-electric cell to convert photons to electrons. The challenge was to make light scan the scene. The announcer, therefore, was invited to sit in an entirely black box. In front of him was a thing called a Nipkow disc, which was a large circular piece of steel spinning at high speed, with a spiral of holes punched in it and a very bright light behind it. The light scanned the scene; the photo-diode output an analogue signal corresponding to the reflection. If you did not have photosensitive epilepsy before, you probably did after a shift or two of this. And of course you could not read a script, because you were in total darkness apart from this blinding light rapidly flashing across your face, so you had to try to remember what you were supposed to say. That worked for a static announcer, but not for anything in the way of entertainment. So Baird fell back on the good old standby of film. He knew how to make a cathode ray tube scan film to create a television picture. Part of the Baird Television Company became the Cinema Television Company which became Cintel, global leader in flying spot telecines while the world needed flying spot telecines. Received wisdom was that film took an hour to process, which was not particularly immediate compared to the EMI electronic cameras, so Baird set about working out how to shorten the cycle. He got it down to 54 seconds. The camera sat in a soundproof box, with the film going straight into a processing tank, then a washing tank, then being scanned. The only way that it could be washed and fixed quickly enough was to fill the tank with cyanide. The only way to avoid streaks was to have the 25kV CRT immersed in the tank. The only way to stop bubbles being dragged into the frame by the sprocket holes was to kick the tank regularly. Yes, a man was employed to stand next to an open tank of cyanide solution containing a very high voltage and give it a kick. Well, it was a job. There was also the practical challenge that the live action had to start 54 seconds before the announcer finished the speech, which he was probably making up because he had no script or prompter in his black room. It is, on reflection, no surprise that the Baird system was abandoned after only three months of the competitive trial. A sad but fascinating insight into the history of our industry.